Rashaun Coleman takes on North Lake as the Harvesters lost the MAC tournament championship game to the Blazers. Coleman scored 11 points. Photo by Willie R. Cole/The Et Cetera. North Lake defeated Eastfield 92-83 in the championship match of the Metro Athletic Conference tournament. Now, both teams will face off in a one-game playoff, the Blazers as the tournament champions and the Harvesters as the regular conference play champions, which will be played Monday night at 7. The winner advances to the national tournament in Lock Sheldrake, New York, played March 15-17. Eastfield coach Anthony Fletcher said the team didn’t seem ready to go while the Blazers played like they had everything on the line. North Lake started the game fast and took an early 23-4 lead. Eastfield tried to get back into the game but missed a lot from field goals. From then on, the Blazers maintained plenty of breathing room, never letting up their offense, even as Eastfield tried to reduce the deficit. The Blazers outscored the Harvesters through field goals 34-12 in the first half, with only Anthony McGee and DaJaun Ridgeway scoring from the field. Despite Eastfield turning that around in the second 51-32 while converting seven of eight free throws, it wasn’t enough to catch up. We took the win today against @eastfielddcccd! NLC 92, EFC 83  Next game against Eastfield determines Region Champions! 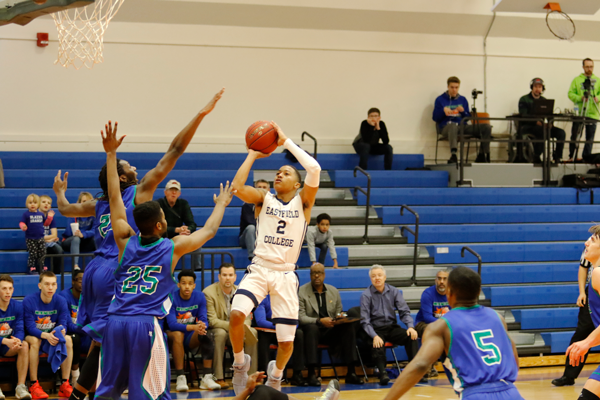 McGee led the scoring for Eastfield with 25 points, sinking seven 3-pointers, with five in the second half as they tried to get back in the game. Ridgeway had 12 points while Rashaun Coleman had 11. Fletcher said the team still has a chance at nationals but expects “another grudge match” against North Lake, making it the fourth time the two teams face this season.